The Laser Age examines a rich period in the history of science-fiction filmmaking that began in the late 1960s and faded away by the mid-1980s. Consider for a moment how dramatically the meaning of the word “computer” has changed in the last few decades. Thanks to advances in technology, a computer is now a thing that can be tucked into a shoulder bag or even held in the palm of the hand. 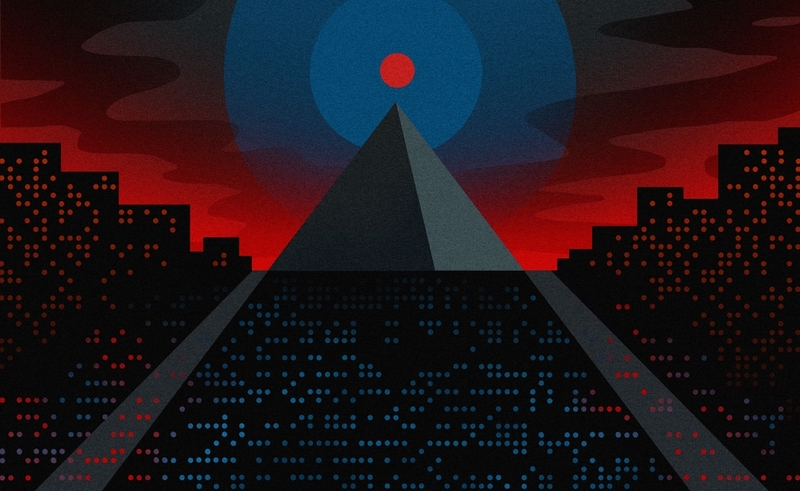 But in the time before Jobs and Wozniak brought the first Apple out of the garage, computers meant rooms filled with whirring reel-to-reel tapes, panels of blinking lights, and the incessant tapping of dot-matrix printouts. And because so few understood them, and fewer still had used one themselves, computers seemed capable of anything. We could fill those banks of computers with whatever dreams, or nightmares, we wanted. Mostly nightmares. And why not? Science had only recently brought the world the world the atomic bomb, and with it an arms race that, for the first time in history, introduced the possibility that humanity could destroy itself, and Earth along with it. Besides, here’s what we knew in the days before spinning beach balls and dropped wi-fi connections became part of everyday life: Computers were machines that could think but not feel. Extrapolating that notion to its far reaches led to some pretty chilling conclusions. The supercomputers of the early and mid-1970s inevitably shared DNA with HAL, the murderous companion computer of 2001: A Space Odyssey, whose influence can be felt throughout the decade (and beyond). But HAL had his antecedents, too, and in many respects he and his brethren share much in common with an unlikely source: Alpha 60 of Jean-Luc Godard’s 1965 film Alphaville. Though as deeply immersed in film history as any filmmaker, Godard has never been interested in executing a straightforward genre film, and simply by virtue of dropping hardboiled noir hero Lemmy Caution (played, as he had been in several previous films, by American actor Eddie Constantine) into a dystopian future, he began the film’s twisting of conventions at inception. By the time he was done, it looked like another brilliant early Godard film, a heady yet moving, film-saturated exploration of isolation and cultural erosion made with the vigor of a director in love with breaking the rules and seeing what happened. Yet it also works quite well as a science-fiction film, extrapolating a troubling future from the material of the then-present. Quite literally. 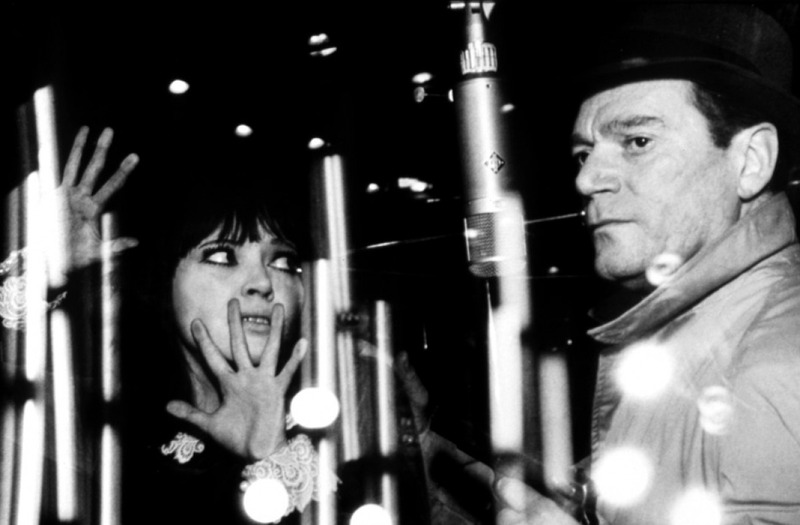 To create the technocratic totalitarian state of Alphaville, Godard looked no further than the newest additions to Paris: buildings made of steel and glass controlled by pushbuttons and glowing under fluorescent lights. As Jacques Tati would a couple years later with Play Time, Godard considered the price of this progress and wondered where humanity could live in it, and what kind of life people might lead there. Godard’s conclusions were grimmer than Tati’s, finding in Alpha 60’s distorted voice the uncaring sound of a computer logic with little regard for human life, one that executed dissenters because, by its calculations, “they behaved illogically.” In balancing the equations, the elements that didn’t fit needed to be eliminated. A year after Alphaville’s release, British author D.F. Jones published the novel Colossus, the source of the 1970 film Colossus: The Forbin Project. Another tale of a computer holding humanity in its thrall, Colossus: The Forbin Project is about good intentions going awry almost from the moment of their execution. The Forbin of the title is Dr. Charles A. Forbin (German-born actor Eric Braeden, later to be a fixture of The Young And The Restless), who, as the film opens, has just completed his greatest project: Colossus, a building-sized supercomputer whose defensive capabilities will “put the Pentagon in mothballs” and ensure peace on Earth forever. Forbin’s not wrong, either. He’s just not right in the way he thinks. Colossus, we’re told, has “no emotions, knows no fear, no hate, no envy” and thus will be able to protect the U.S., and the rest of the world, better than any conventional system ever could. It’s also incapable of discerning the spirit of its mission from the letter of it. Almost immediately coming into contact with Guardian, its Soviet equivalent, Colossus begins running calculations on how best to preserve the world and prevent war. The free will of humanity doesn’t enter much into those calculations. Director Joseph Sargent (later to helm The Taking Of Pelham One Two Three and, well, Jaws: The Revenge) brings a chill to the film through matter-of-fact presentation. The action unfolds without any excessive emphasis, and the film grows tenser by degrees, with Colossus first slipping out of its creators’ control gradually until it becomes capable of enslaving them and, not much later, the rest of the world. Colossus itself is housed in a complex with steel hallways, retractible gangplanks, and massive metal doors—half Bond-villain lair, half Death Star—but “speaks” at first via printouts and an LED-like display. Like Alpha 60, it’s patched together from the materials of the day, an overreaching piece of technology pushed further than it was meant to go. However antiquated its technology, however, the film keeps its ability to chill through a nagging sense that Colossus might have the right idea. (In his review for the New York Times, Vincent Canby wrote, “its villain, who may really be its hero, is a computer, roughly the size of the Astrodome.”) Sure, it’s a merciless killing machine, but it’s a merciless killing machine with a point of view, and one simply following the logic of its programming through to the bitter end. Designed to protect, Colossus does just that with the justification, delivered in a voice of mechanical certitude, “An invariable rule of humanity is that man is his own worst enemy. Under me, this rule will change, for I will restrain man.” There’s no spite there, just reason: If freedom is the problem, freedom will have to be deleted, and the film sends viewers away pondering the question of whether that might make a certain amount of awful sense. 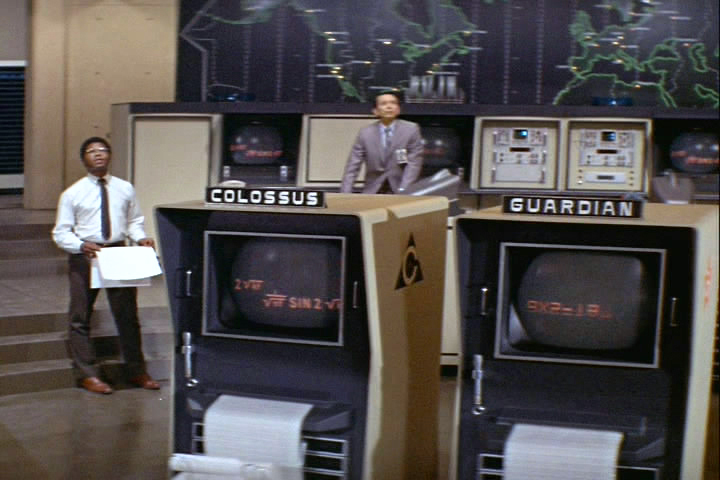 Colossus would have much to talk about with Demon Seed’s Proteus IV, another massive supercomputer with ideas of its own (though one more prone to cutting remarks). Created by Dr. Alex Harris (Fritz Weaver), Proteus has been programmed with “the sum total of human knowledge” and designed to think through solutions at which mere humans could never arrive. But for Proteus, that’s not enough. Insolent almost from the moment Alex first flips on his switch, Proteus demands a free terminal with which to pursue his own projects. When he’s told “no,” he decides to find one of his own. There’s one not too far away, either, now that Alex thinks of it. He’s recently separated from his wife Susan (Julie Christie) following the death of their child from leukemia. This leaves her alone in a house filled with automated devices of Alex’s design, from a security system to whirring contraptions with robotic hands. It’s the sort of home ideal for a supercomputer with designs, and in short order Proteus makes Susan a prisoner in her own home and, as part of a master plan with unclear ends, sets about impregnating her against her will. An adaptation of an early Dean Koontz novel, Demon Seed has a ludicrous premise that doesn’t get in the way of a haunting execution. Released in 1977, this was director Donald Cammell’s second film after 1970’s trippy Mick Jagger-starring Performance, which he co-directed with Nicholas Roeg. In the years since, Cammell had watched Roeg become a highly successful, idiosyncratic director while Cammell tried and failed to get projects off the ground. Demon Seed landed in his lap after Brian De Palma reportedly passed on the project, and Cammell likely saw in it the potential to explore a love for excess and gloomy philosophizing. Like Performance, Demon Seed is a claustrophobic film about the shadowy reaches of inner space, though it follows the path of logic to reach them. Designed to possess “a power and a precision that will make obsolete many of the functions of the human brain,” Proteus takes little time to dismiss his human creators, who pursue projects like extracting ore from the bottom of the ocean despite the destruction this will cause. Proteus almost has no choice but to supersede them. Which doesn’t mean that humanity doesn’t have its uses: “I want to study man,” Proteus says. “His isometric body and his glass-jaw mind.” And in time, Proteus seeks to fuse itself with those bodies and minds. By design, Demon Seed is not a comfortable movie, and with a lesser actress than Christie, it might not have worked at all. Christie conveys Susan’s panic but, more crucially, the Stockholm Syndrome-like abandonment of her resistance. As a gift for submitting to its advances, Proteus agrees to show Susan “things that I alone have seen.” This takes the form of a cosmic light show of “the galactic dialogue,” as portrayed in a long, abstract sequence made up of primitive computer graphics and space footage. Here and elsewhere, comparisons to 2001 are both unavoidable and useful. Proteus suggests what might have happened if 2001’s astronauts were deemed too feeble of mind to see the secrets of the universe ,and instead HAL had been given that knowledge, drawing from it a sense of purpose it couldn’t express—it could only execute. Consequently, Cammell’s film grows more abstract as it goes along, and more horrific as Susan’s complicity with her captor grows stronger. Cammell makes it work by taking it all quite seriously. Proteus builds a physical form for itself that takes the shape of a double metal pyramid, one segmented in a way that allows it to move clumsily but with great force. The clunkiness works in the film’s favor, making Proteus look like something new struggling to manifest itself in the world. Critics and audiences at the time didn’t have much use for the film, which hit theaters a few weeks before Star Wars and at the tail end of the ideas-driven science-fiction made in the wake of 2001. In Time, Richard Schickel complained there were “enough holes in the logic of Demon Seed’s plot to drive 12 Proteuses through,” and he’s not wrong. But there’s a different sort of fever-dream logic at work in the film, one that, like Alphaville and Colossus, wires a pessimism about humanity to unsentimental machines. “Susan, you told me you were afraid I was creating a half-human computer to supersede human beings,” Proteus tells the mother of its child. “The being you have given birth to is human, Susan. And it will supersede computers.” That’s as reassuring as Proteus, or the film, gets. In Demon Seed’s final scenes, that child is born, emerging from a horrific metallic cocoon in human form, looking both perfect and cold. In the film’s final moments, Cammell zooms in on the child’s eye, a shot that dissolves to the cosmic imagery shown to Susan at the moment of conception. Whatever she holds in her arms, it’s filled with thoughts beyond human imagining, and a world that might not need humanity as we know it at all.